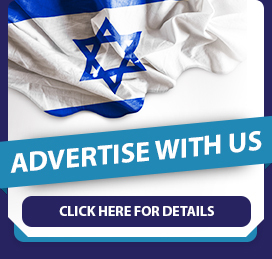 Whenever you visit this naturally beautiful country, Israelis will try to coax you out of the A/C and into the sunshine, no matter how hot it is, to enjoy “the nature,” as they call it. Here is a list of picnic foods to sample, and places you can sit to chow them down. The Dan River in the northern Galilee, with its rush of chilly waters and open banks, is a pretty idyllic spot for a picnic. This area also houses some culinary goldmines. 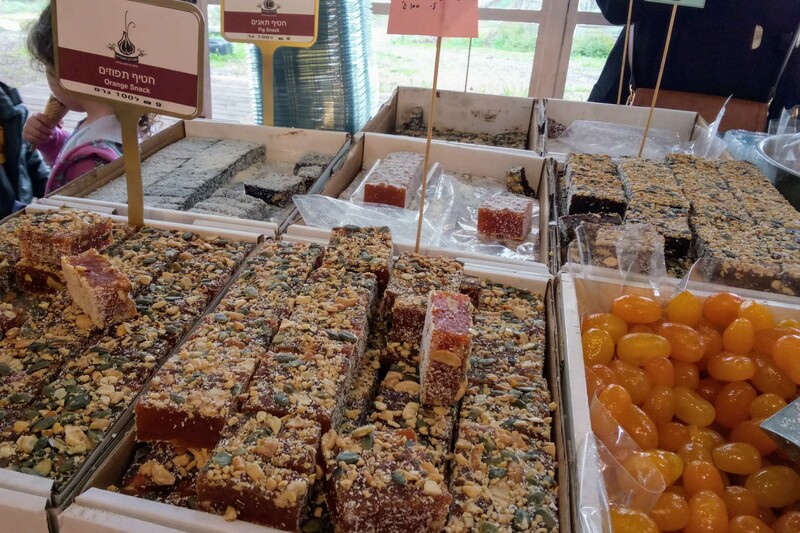 If you want to pick up dessert-to-go, head over to the Shulman chocolate factory on Kibbutz Dafna; freshly smoked and cured fish at the Dag Al HaDan restaurant store on Kibbutz Snir; and head to any old river bank to feast. Bring along some great bread and something to drink. A good way to experience the local culture of a place is just to dive right in. 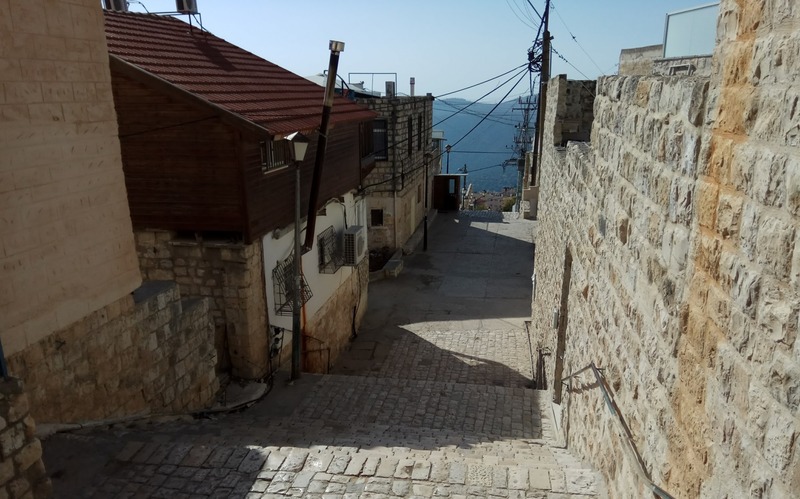 Like other communities with a mostly ultra-Orthodox Jewish population, such as Bnei Brak and the Mea She’arim neighborhood in Jerusalem, the Old City of Safed (Tzfat) is home to a traditional Ashkenazi-based food culture. Restaurants proudly display dishes like stuffed cabbage, kreplach, and braised sweet-and-sour tongue. A tradition of ready-made homey foods to go is especially strong in Tzfat at places like Mendi’s Restaurant on Friday mornings. It is also perfect for picking up a variety of traditional foods and salads (and don’t forget the challah bread!). While you eat, take in the surrounding mountainous forest views from any ancient steps you feel like resting on for a bit. 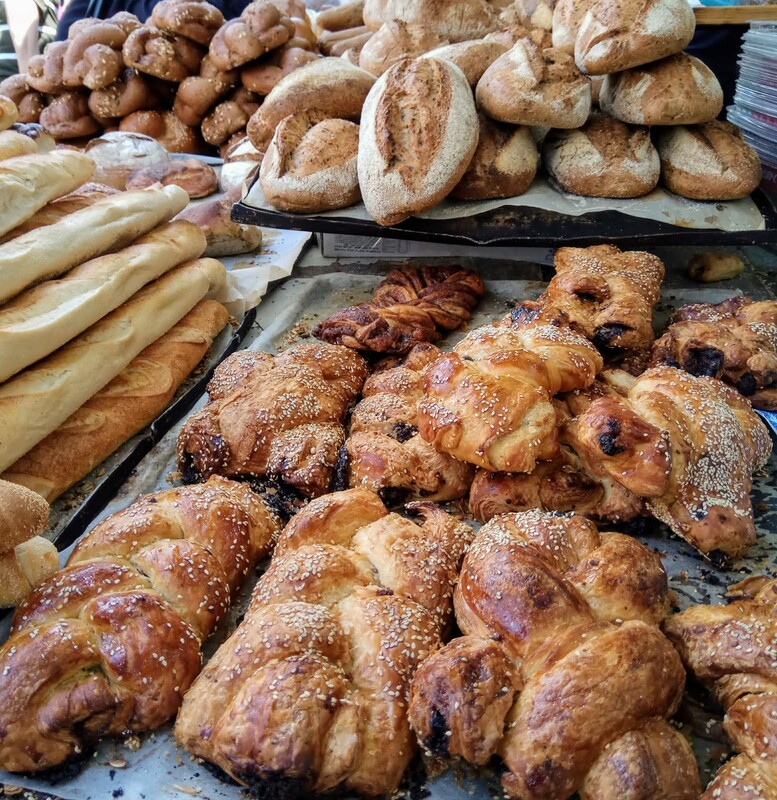 Israel’s many outdoor and indoor gourmet food markets make the country a foodie playground and are also a great source for amazing picnic loot. These days, Jerusalem’s Machane Yehuda market is jam-packed with restaurant and gourmet food choices alongside vendors selling fresh fruits and vegetables each day. Take your pick of sesame-donned honey-drenched rugelach, peppery-sweet Jerusalem kugel, or more trendy flavored halvas, exotic dried fruits, or whatever the latest fast food spots offering authentic foods from a variety of cuisines happen to be, and then head out of the madness to have a serene picnic at the Wohl Rose Garden near Israel’s Parliament (Knesset). In Tel Aviv, the Tel Aviv Port Market is known for its rare produce stock and gourmet slow-food stalls; the Sarona Market upscale indoor food mall offers anything from French pastries to fresh fish, and food stands run by Israeli celebrity chefs; and Shuk Levinsky is known for its wide array of foods that are as ethnically diverse as the county’s population. 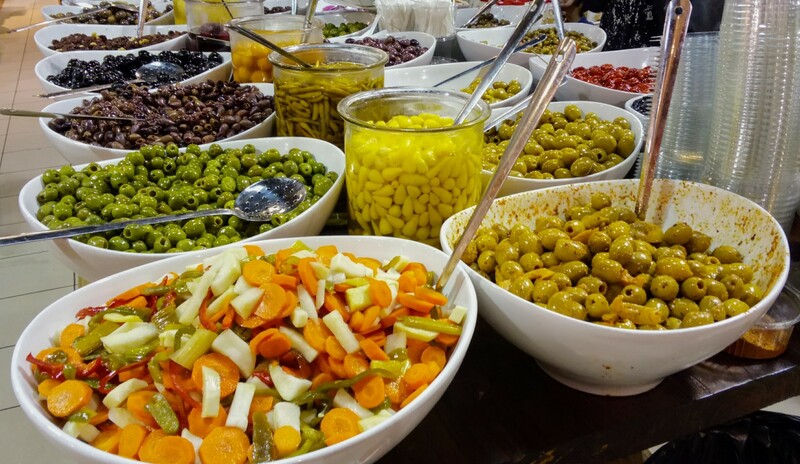 In Shuk Levinsky, visit Yom Tov Delicatessen for olives, preserves and other home-cooked Turkish delights that the family still cooks up and lovingly peddles after 51 years of business. Sarona Market has plenty of grassy knolls and beautifully landscaped grounds including musical benches, mini ponds with lily pads, and orange trees. Levinsky Market is not far from the lovely Jaffa shoreline and the wooden beach boardwalk lined with benches that are both functional and artistic — a perfect spot for a waterfront meal. 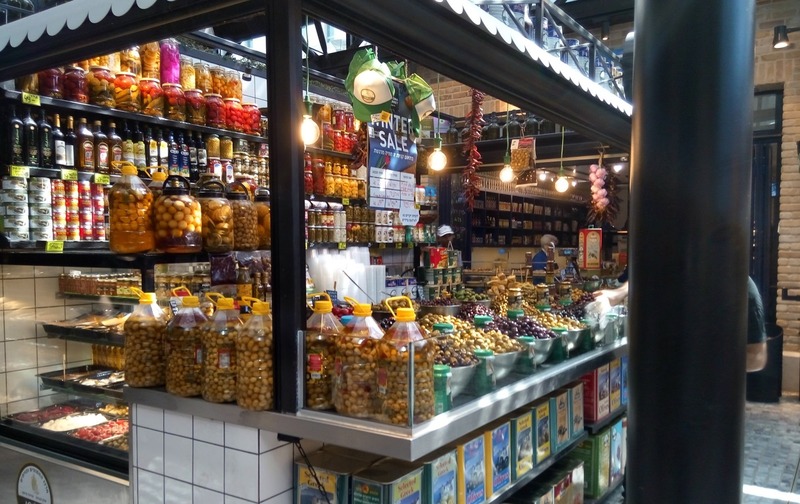 Another shuk known for its selection of authentic Iraqi, Indian, Persian and Turkish foods is Ramla Market in the city just south of Ben-Gurion International Airport. 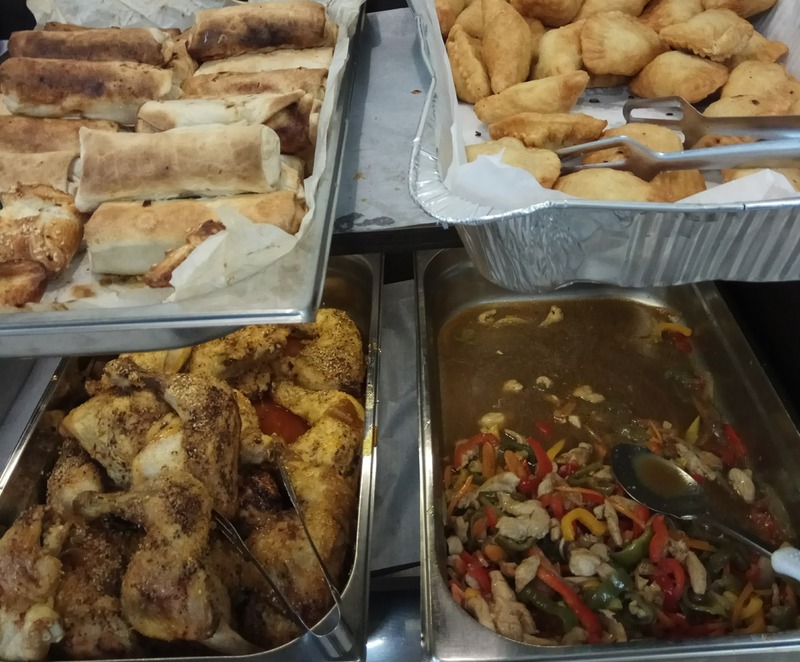 Stop into Etzel Naji (Naji’s Place) to take away several different kinds of kubbeh (semolina and meat dumplings) and homemade stews, or pick up Iraqi pita, fruits and vegetables, and of course pickles from the famous Carmel’s Pickles. 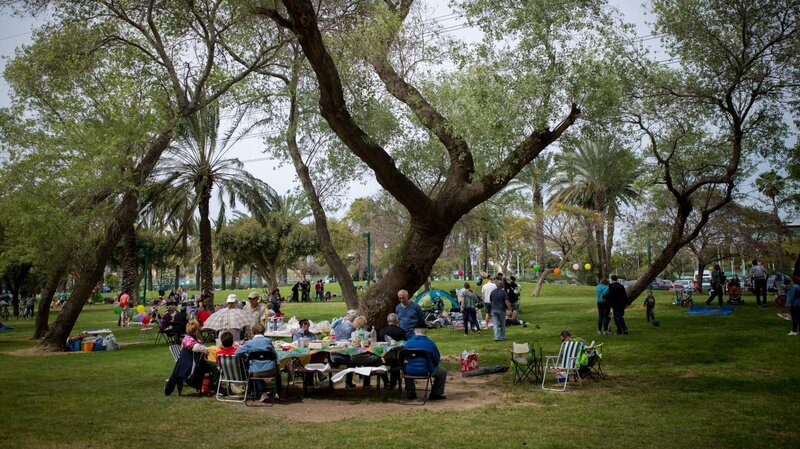 Once you’ve gathered your lunch, drive 15 minutes down to the playground/park/nature reserve that is beautiful Gan B’Ivrit in Rishon LeZion. Unpack and enjoy your picnic in a shady, grassy area. Don’t feel like fighting off tourists and locals in the crowded markets? Head to Ibn Gvirol Street, where you’ll find countless chocolatiers. Further up the road is the famous Breads Bakery. Then it’s a hop, skip and a jump to Gourmet Shop, which holds the key to every foodie’s picnic dreams, selling fine French wines, cheeses, olives and many other delicacies. Take your bounty and head 15 minutes by foot to Park HaYarkon to dine like royals by the river, or venture down a few extra minutes to reach the glorious Tel Aviv beach and marina. Many Israeli shopping malls turn into prepared-food markets on Fridays, or on specific weekdays. Grand Canyon Mall in Haifa is one such example, turning its third floor into a gourmet food paradise packed with vendors selling cakes, cheeses, wines, preserves, and home-style cooked dishes on Thursdays and Fridays. Next to the market area on the third floor is Lagaat Ba’Ochel, a store that sells bulk spices, imported and gourmet foodstuffs and baking supplies. At the other end of that level is the Haifa branch of the famous Bashar Cheese empire, which sells fine cheeses from all over the world alongside local artisan bread, area boutique wines and other delicacies such as truffle butter and antipasti. Dine on your deli finds under the decorative copper ceiling in the mezzanine seating area, and you will completely forget that you are in a mall. Dates are the ultimate hiking food. They travel well and are nutritionally dense, which means they are also ideal for taking on picnics. Tamar HaKinneret lets you sample all the date products produced from its sun-soaked orchards next to the Sea of Galilee (Lake Kinneret). Taste and take away specialty local products such as date honey (silan) and then head off to dine in Switzerland Forest, a green park overlooking the sea. 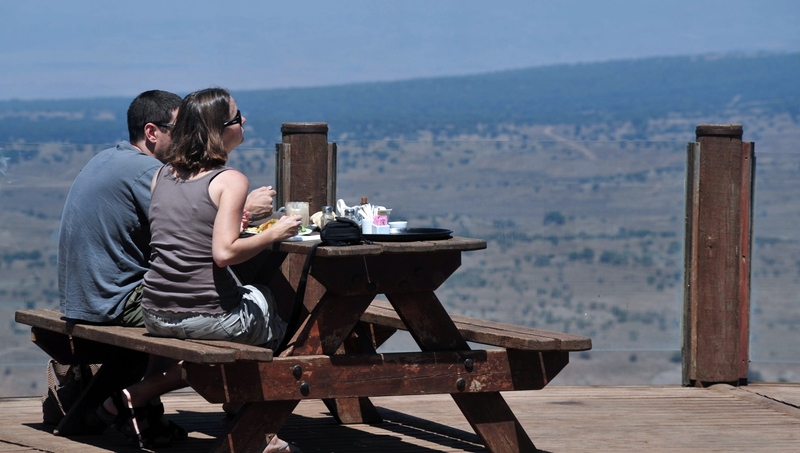 One of the best places in all of Israel to scavenge for foodie finds is the Golan Heights. This plateau produces some of the crispest apples and juiciest berries in the country and is also a known mountain getaway for escaping the brutal Israeli heat, which makes it a perfect hotspot for Israeli wineries as well. And you just can’t beat the vast vistas. To take in all the Golan has to offer, we suggest spending some time in Ein Zivan, picking your own fruit at Bustan Bereshit and visiting Bahat boutique winery before setting off for windy Mount Bental to take in the views of the surrounding countries and the authentic war bunkers from the 1967 Six-Day War. The best part is the parking lot, where Druze families sell home-cured olives, deep green olive oil, pickles, fruit — and if you’re really lucky, freshly made tortilla-like pita Druze slathered with sour labane cheese and zaatar, or sweet chocolate spread. If quiet reflection is what you’re after, there’s nothing quite like picking up your picnic supplies from a monastery that bans talking. Even though they can’t communicate, the Trappist monks of the Monastery of Silence manage to produce some pretty great wines, liquors, olives, olive oil and honey, as well as keep their grounds beautifully maintained. Choose your favorite wine varietals and snacks before spending the afternoon quietly grazing in the surrounding garden under olive trees near some of the area’s archaeological ruins, before heading across the way to the Latrun military museum. Although it’s bound to be packed to the brim on a weekend, head to Havaat Derech HaTavlinim (The Spice Path Farm) to tickle your senses with practically every spice known to man, but also a whole host of dried fruit-based tea mixes (an Israeli specialty); nut-based mixes for adding to spreadable cheeses or topping a salad, as well as other little treats such as bulk halva and granolas. On a quiet day, you can secure a spot on the back patio to munch your goodies, overlooking neat rows of fresh herbs grown onsite. If it is too crowded, head back down the road toward Alonei Aba Nature Reserve to eat there among then grass-grazing cows, tall trees, and meadows.